I once read that Brian Wilson of the Beach Boys went through a troubled stage where he ate half a birthday cake every day. With all due respect to Wilson, I’d happily eat a whole birthday cake every day and I’m fortunate enough to not even be feeling particularly troubled at the moment. If only cake had any nutritional value. I know – want, want, want. A solution of sorts – there’s this recipe for vegan banana bread on the gorgeous Savvy Soybean blog which turned my head. Last week, with bananas rapidly browning in my fruitbowl, I got round to making it. Oh yes. It’s another post where I semi-patronisingly assure you that a vegan recipe tastes pretty good, even though it contains no butter. But really. This banana bread is delicious stuff and you expend hardly any energy while making it. The finished product is really quite good for you especially if you can get your hands on the agave nectar, which somehow manages to be sweeter than sugar but with a much lower glycemic index. What an overachiever. Most important: it tastes so good. Set the oven to 180 C and line a loaf tin with baking paper. Then, very simply, mix together the bananas, applesauce and honey, then fold in the dry ingredients. Don’t overmix. Turn the batter into the tin and bake for one hour. Pa-dah! Applesauce can easily be made by simmering one large, diced apple in 1/2 – 1 cup water for about fifteen minutes (keep an eye on it, it may need more water added) before roughly mashing with a fork. The original recipe included 1 cup chocolate chips which I didn’t have, I’m sure they’d be an amazing addition but it was delicious without all the same. The bananas, applesauce and agave nectar or honey keep this moist and light. Combined with the cinnamon, this will fill your kitchen with a proper, comforting, wish-I-could-bottle-it baking fragrance. It keeps for ages and is very easy to slice. While it’s lovely as is – okay, a little chewy as opposed to straightforwardly cakey – it really comes into its own when toasted in a sandwich press. These warm, crisp slices of banana bread are brilliant with sliced plums and maple syrup any time of day, or with any other fruit really, plums is just what I got right now. It is, in fact, so very good toasted that next time I make this I might just slice it, bag it up and freeze it for whenever I require a slightly puddingy snack (which is often…really often). I’ve been feeling a bit lethargic and brain-heavy lately – like I need to take a whole day out and just sleep before I can get on with everything properly. At any rate, I’m definitely going to need my energy this month – on the 17th Tim and I will be getting up close and personal with Jack White at the Dead Weather concert at Powerstation in Auckland. It’s been five years since we saw the White Stripes at Alexander Palace in London and while both of us are all “make new music together already, Jack and Meg” the Dead Weather is still a very, very anticipation-worthy engagement. Maybe eating more vegan banana bread will help perk me up? Title comes to you via: Hole’s Celebrity Skin Although the Spice Girls had my heart, I wanted to be Courtney Love so badly after MTV Europe came to New Zealand TV for a few brief but heady months. If I’d had a disposable income in 1998, there was not much I’d have wanted more (apart from a Spice Girls polaroid) than to lunge around the place wearing floaty dresses, with flowers in my hair and sparkles stuck on my face, holding a guitar. Actually I still do, let’s be honest. I found Miss World while trawling through Hole music videos. Forgot how much I love this song. I think I’m going to be buying some Hole albums. Going to DC from Gavin Creel’s album Goodtimenation. I love love love Gavin Creel but to be honest this album doesn’t get played an awful lot, I just haven’t really connected with it. This song is the exception…I love how it’s all bouncy and adorable and ska-ish. And involves Gavin Creel. I’m Waiting For the Day by the aforementioned Beach Boys from the incredible Pet Sounds. The drums! The fake ending! I didn’t actually think I even liked the Beach Boys until I heard this album. It’s breathtaking stuff. Ha…love that you referenced Brian Wilson's cooking habits. I think I'd get tired of a birthday cake that often but I love the idea. Did he actually put candles on it to make it a birthday cake or was it just a big chocolate cake? I wonder why Brian Wilson insisted on birthday cake? I'm glad Sadako is also perplexed by this. Oh, please the tofu balls! I'm also just in love with the fact that your grandma has a tofu recipe. But simultaneously horrified that you were speaking the truth on my blog about having no chocolate in the house. A half a birthday cake a day? That is an awesome food anecdote even if it is unhealthy! 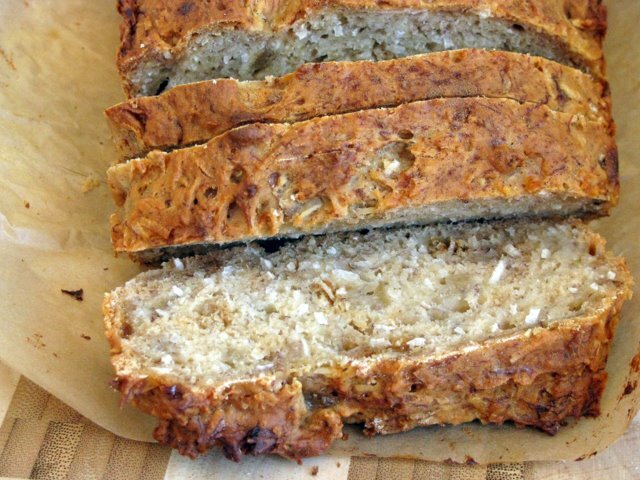 These banana bread looks wonderful and I love how guilt free it is! Sadako: Apparently he liked the icing…maybe it was a psychological thing. And thanks! Hannah: Glad to hear the tofu balls have a supporter!! Chef Aimee: Thanks, and yes, this banana bread is pretty darn good for you as far as these things go. Love that it is not just about eating a cake, but a BIRTHDAY cake… awesome. Looks even easier than the bread – which I still haven't made yet but have intentions. I just bought a jar of agave nectar and I think I am going to try it out with this light and delicious bread! Wow, that banana bread actually sounds pretty good (albeit without butter!). 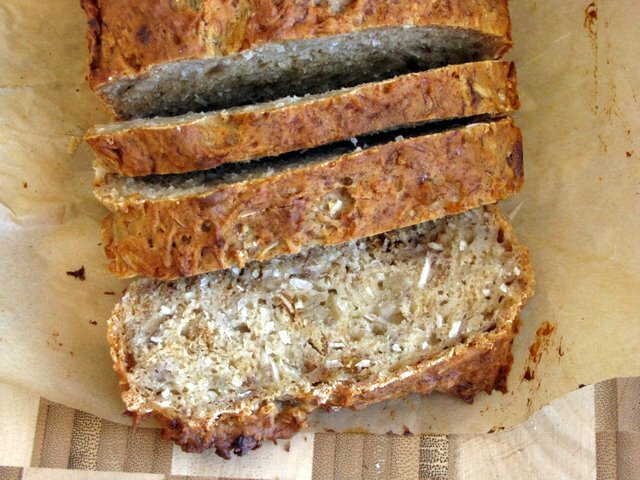 I have tried some other no-butter banana breads in the past and they have turned out quite chewy, but still very good toasted. I am a sucker for toasted banana bread. Some things are just better toasted (crumpets, easter buns etc). I am going to make this! (I still want to make the fetta bread too!) You always blog so much cool stuff!